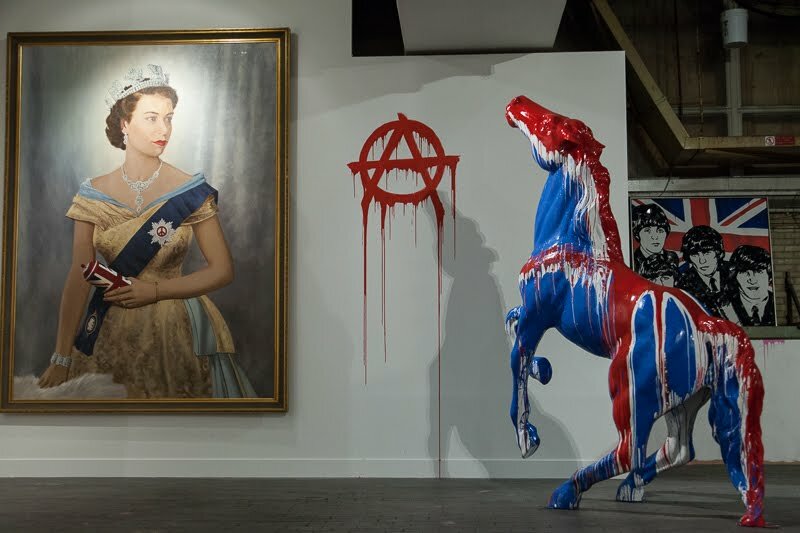 The solo show of Mr Brainwash aka Thierry Guetta, reopened last Friday. The enormous space of the old sorting office on New Oxford St is filled with his installations, murals and art. Is the slightly mad Frenchman from LA, whom we met in the film "exit through the gift shop", a great artist, or as many believe, part of a giant hoax by Banksy and Fairey. This is further fuelled by the fact that no-one has actually seen Mr Brainwash working. However by his own admission, he is the ideas man and a team of technicians put the work together. The same can be said of Damien Hirst. The tight security akin to a visit to the crown jewels, or perhaps more like a visit to a jewellery store in New Bond St. The dark glasses and suits the clue here adds to the fun of the exhibition. No-one was able to tell me how long the re-opening is extended to, but I would recommend making your way there soon. An interesting piece that you've shown us. I wonder if these fellows will be remembered for their art or for being a mystery. I kind of like this piece. I really enjoyed 'exit through the gift shop'. Looks utterly fascinating! Would love to pop over and visit it. I think I go with the hoax idea but it is fun anyway! You can record another vote in the hoax column. Always fun with a mystery every now and then.